The capital of Jamaica is Kingston. If you look at the map of Jamaica, you will discover that the parish of Kingston is actually very small. Indeed it is the smallest parish in Jamaica and popularly referred to as "downtown". So small is it that the parish to the north, east, and west, St. Andrew is often loosely referred to as the capital as well. Many Jamaicans who say they live in Kingston actually live in St. Andrew. It is this combination of Kingston and St. Andrew (even the local government bodies are merged) that results in Kingston being regarded as the largest city in Jamaica. When one refers to the corporate area, it is to Kingston and St. Andrew. 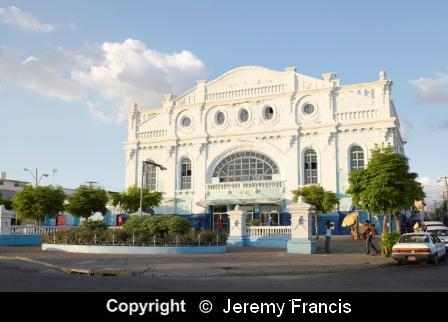 The pictures of Jamaica you see below, are the works of well known photographer Jeremy Francis, one of Paul's two photo shoot partners (the other being Franz Marzouca) for the photos he has offered featuring Kingston and St. Andrew landmarks. You will recall from your visit to Port Royal that Kingston was born after Port Royal was destroyed by earthquake. Kingston grew rapidly in importance and later became the capital of Jamaica. 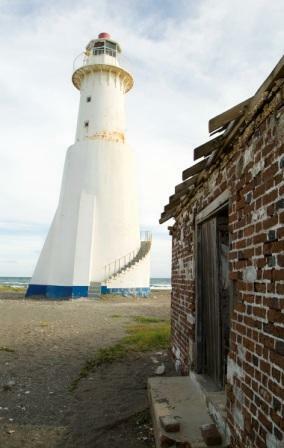 Now Port Royal is a part of the city of Kingston and its Plumbpoint Lighthouse guides ships into our famous Kingston harbour. The centre of Kingston is a hub of activity. There is the centre of legal enterprise, with the Supreme Court dominating King Street, the terminus for the buses that come into the city from all over the island, St. William Grant Park and Ward Theatre making up the area known as Parade. Built in 1912 after the 1907 eathquake which stole the lives of thousands of Kingstonians and demolished buildings, the Ward Theatre was a gift from Colonel C. J. Ward. 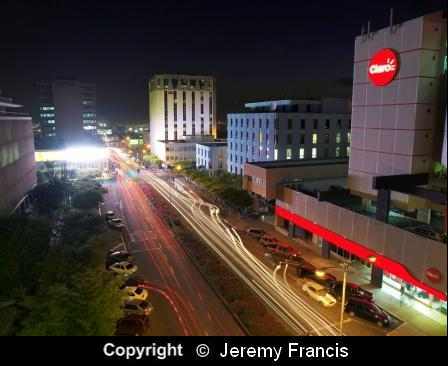 Further north or uptown is New Kingston, the nerve centre of business and entertainment in the corporate area. At night the clubs in New Kingston are the places to party. 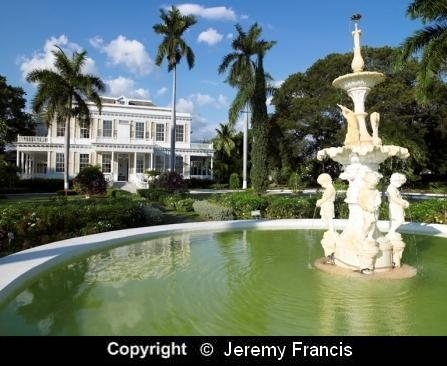 Another well known national monument is Devon House. 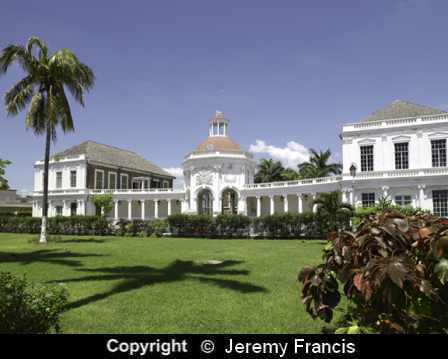 A haven to visitors and locals alike, Devon House is reputed to have been owned by Jamaica's first black millionaire, George Stiebel. There you can enjoy a beautifully resotred mansion, gourmet meals, Jamaican arts and crafts and our famous Devon House Ice (S)cream. The capital of St. Andrew is Half Way Tree, the shopping hub of the corporate area. 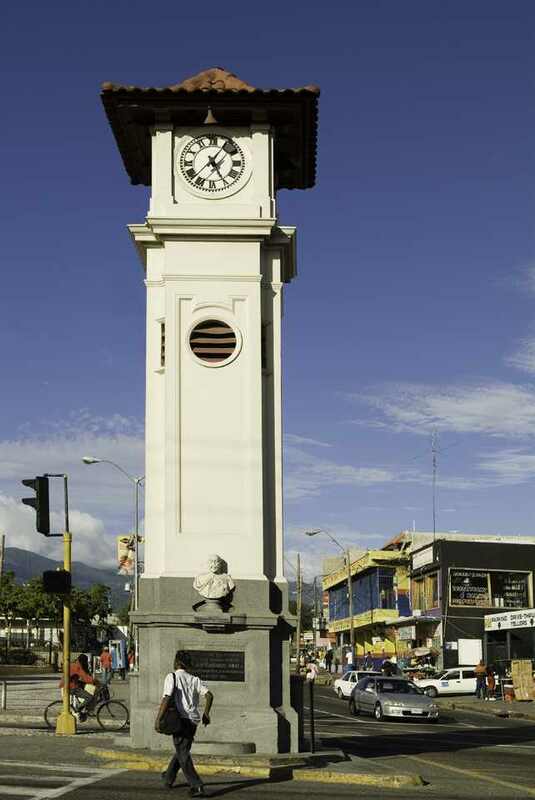 A variety of malls and stores abound along this busy thoroughfare famous for its clock tower which replaced an old cotton tree. The tree, the source for this place name, according to the National Library of Jamaica, was halfway between the English soldiers' camp in Greenwich, St. Andrew and their fort in Spanish Town. The Athlete stands tall in front of the National Stadium, St. Andrew, stomping ground of Jamaica's champion track stars. 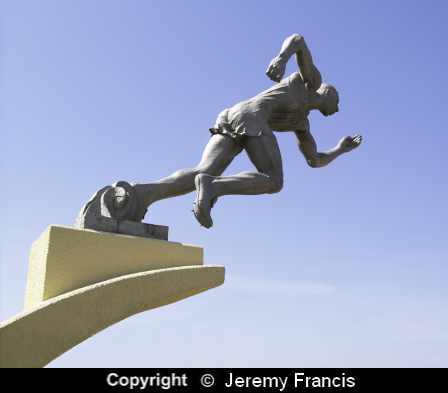 Inspired by the performance of our quartet in the 4 x 100 metres relay at the Helsinki Olympics in 1952, sculptor Alvin Marriott created this masterpiece. 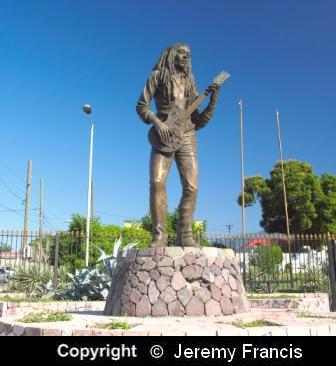 Not far away another of his works, the bronze scuplture of our beloved legend, Bob Marley, takes centre stage. Time magazine designated his One Love as song of the century. We leave you with a well known landmark in another capital city. Thirteen miles out of Kingston the current capital of Jamaica is Spanish Town formerly St. Jago de la Vega the old capital of Jamaica. It bears many reminders of our Spanish and English government. Here is a memorial to English naval officer George Rodney, known as the Rodney Memorial. Copyright © 2010 pictures-of-jamaica.com All rights reserved.